It finally feels like we're making some real progress on the Curbly House. After weeks of demolition (and basically just making the house worse than it already was), this was the first week where we actually started improving things. Read on to watch my weekly video journal and read about all of our framing adventures. Yikes! 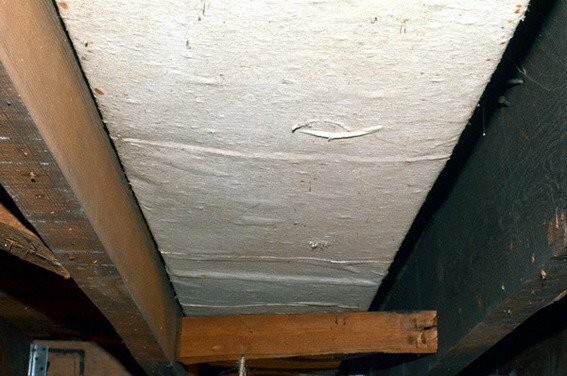 Asbestos in the Curbly House! What to Do? If you’re following our series, you know we’re in the middle of fixing up a 100-year-old house and making it energy efficient. Somehow tearing out all the first-floor ceilings got lumped into the to-do list. Then the second floor ceilings. And a couple of walls. And the bathroom. You know … just … everything. What's in a wall? If you've been following our Curbly House series, you know what was in our walls; squirrel nests, dead things, and lots of hundred-year-old newspaper. But what makes a wall more than just a bunch of lumber and drywall? This week, I'm exploring ways to breathe life into our walls by adding hand-picked artwork. With the help of Art.com, we've got an amazing, expansive collection of artwork available. Read on to see how I'm plotting to decorate the walls at chez Curbly House (hint: no squirrels allowed). Now, if you look at our 'before' pictures, it's easy to see that the house had a heaviness about it; many of the walls were painted darker accent colors, and the woodwork was all stained a dark brown. See what I mean? We've decided to go with a neutral color palette inside the Curbly House to help brighten up the place. Now that everything is sheetrocked and mudded, the house looks a lot brighter and feels a lot happier (even while standing in the inch thick plaster dust that covers most of the floors). Bringing color and light into this house was a priority to us from the get-go. However, both Bruno and I want to be sure not to overdo the "brightness" and make the place feel clinical. So, we're experimenting with paint colors and planning to add a lot of pattern and color to the walls through art! I've been gleefully paging through several art collections on Art.com, like an overjoyed visitor at the Louvre. I spent most of my time perusing the Abstract, Vintage, Modern, and Botanical galleries. Here are some of the ideas I'm tossing around for the stairwell gallery wall, the master bedroom centerpieces, and the sweet prints I want to frame in our kids' playroom. For a look at more of the pieces I'm smitten with, take a look at my Pinterest board (hey, you can even follow me while you're there!). This post was sponsored by Art.com, but all opinions are my own. Whew. We took a bit of a breather on the Curbly House this week, stopping to evaluate how to reinforce several framing issues we discovered during demolition. Read on to watch my weekly video journal and read my latest update on our progress. We're in the middle of a huge remodeling project to create what promises to be our dream house. Last week, drywall started going up and I stopped having contractions, because for the first time in months, the house began looking like a house again. Read on to see how I'm gathering color inspiration for what promises to be a huge paint job. The Curbly House bathroom looked decent, by all accounts, and except for being a bit on the small side, functioned just fine. So I was actually prepared to leave it pretty much as-was, maybe with a few fixture replacements, some new tile, and paint. But what we found when we took out the first floor ceilings underneath the bathroom made that impossible. Read on to find out how we gutted the bathroom, and watch an awesome/scary video (depending on your point of view). Our Energy Rehab Results Are In! We've started out our Curbly House project with a series of energy improvements. Find out how a new HVAC, ductwork, and insulation are paying off. A house is such a personal thing. It’s private, intimate. It’s family. And yet, in most cases, it belonged to someone else before you. And someone else before them. How does a house that belonged to another family for fifty years become your own? How do you know when that change has happened? The first week of demolition on the Curbly House went so smoothly, you kind of had to expect things would get worse in week two. And worse they did get. Read on to watch my weekly video journal and learn how not to take apart a ceiling. The Bagster is a simple alternative to rigid construction waste containers. It's perfect if you're doing a small remodel, or just don't have space for a large Dumpster. This week we really got into it on the Curbly House. We turned a pretty normal looking old house into a mostly gutted mess in just a few days, and loved every minute of it (well ... except the rats). Read on to watch my week two video journal, and find out all the details. I can't tell you how excited I was to finally start real work on the Curbly House. Even if the first week was just me spending a few hours a day over there getting protection down on the floors, walls, and windows, it felt great to actually be doing something. We like to think of homes as impermeable. After all, that’s why we have them; to keep the rain, wind, and cold out. Not to mention insects, small animals, and pollen clouds. But the truth is, your home’s shell is a membrane. It breathes, just like you do. (That’s a good thing!) Every home does it. The important question is not if your home leaks, but how much. We walked into the house at 4:30 p.m. on a cold, dark December afternoon. The real estate agent fiddled with the lock box for a moment, then cracked open the front door. We kicked off our shoes and stepped in. The floors were cold like a skating rink. We left our overcoats on. The place smelled empty.